The patches are mounted on aircraft grade anodized aluminum and are set below the top surface to help protect from damage. Patch sizes are 1/4” x 1/4”. The overall size is 1 -3/8” high x 1-5/8” wide x 0.060” thick and are available with either gloss or matte center gray patches. All colored patches on the perimeter are matte finish. Because these targets are hand cut and assembled, very minor patch mis-alignments may occur. They do not affect the target’s utility. The matte set is available with AR coated optical grade quartz cover glass and are useful in harsh, wet imaging applications. Each has been tested to be water and alcohol proof in submersible environments. The overall size for the AR coated version is 1-9/16” high x 1-13/16” wide x 5/32” thick. NIST traceable calibrations and certificate are available for individual ColorGauge Micro targets at additional cost. For a more detailed description of the ColorGauge Micro Analyzer please download the ColorGauge Micro Analyzer™ Technical Brochure. 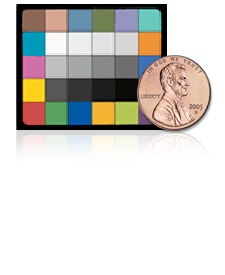 View our Excel document of Micro/Nano Target Colorimetry Data. View our ColorGauge Targets Comparison Chart. Let us create custom colors for you.